Let’s explore the non-app customize-your-iPhone button: Settings. 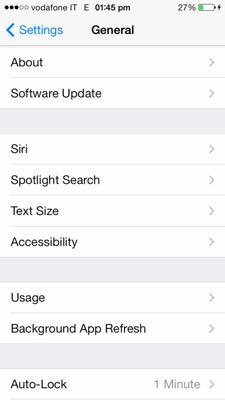 Here you adjust iPhone’s numerous settings to suit your style, including date and time, screen brightness, default ringtone, and background wallpaper image options (to name a few). 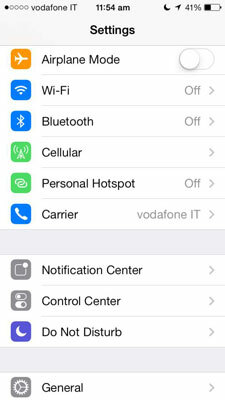 You can also turn various networking features on and off; tweak individual app settings and choose which ones can access your location or send you notification messages; create and manage e-mail, contacts, calendar, and notes accounts; manage iCloud syncing and backup; and view information about your iPhone’s system software, usage, and capacity. Settings is command central for just about everything your iPhone does. Some settings, such as the image that appears behind the buttons on the Home screen — referred to as wallpaper — can be changed in more than one way. For instance, when you capture a photo with Camera, you can then choose that snapshot as your Home screen or Lock screen (or both) wallpaper image. Using the Photos app to browse images you copied from your computer is another way to change iPhone’s wallpaper setting. Tap Settings to display iPhone’s list of settings, and then scroll up and down the list and tap on one you want to change. Tap the button in the upper left corner, it displays the name of the previous screen and you can tap, tap, tap until you reach the very first Settings screen. Flick right, as if turning back pages in a book with an index finger. The General setting screen is actually a catch-all for more than a dozen individual settings. Many settings in Settings have multiple levels. Tap the arrow, also known as the disclosure triangle, to the right of the item to go to a deeper level and see more options; tap the button in the upper left of the screen, or flick right, to return to the previous screen. About: Tap Name to change your iPhone’s name. Beneath that, view detailed information about your iPhone that includes serial number, phone carrier, hardware model and software versions, the number of songs, photos, videos, and applications, the total amount of memory space used, a bunch of interesting-looking regulatory logos, and page after page of tiny legal information about permissions, rules, regulations, warnings, and disclaimers. Scrolling down to the bottom, you find Diagnostics & Usage. If you want to “help” Apple improve products by letting them know how you use your iPhone, tap Automatically Send. If you’d rather keep your business to yourself, tap Don’t Send. Software Update: If a new version of the operating system, also known as iOS, is available, tapping this button downloads and installs it to your iPhone. Make sure your iPhone is connected to a power source and Wi-Fi while installing. Siri (Only on iPhone 4S and later): Turn Siri On or Off and choose how you interact with Siri. Siri can adjust many of your iPhone settings but needs to be on to enable dictation and receive requests. Spotlight Search: For choosing which apps (and app contents) Spotlight searches, and the order in which they will be searched. Text Size: Certain apps support something called Dynamic Type, which means the text size changes based on your preferences. Tap this option and then slide the slider to the text size that’s comfortable for your eyes. When available, for example in Mail, Messages, Contacts, and Reader, the text will appear in the size you set. Usage: Lists how much storage each app on your iPhone uses and how much overall storage remains. Tap an app to delete the app or delete the contents of an app, such as courses in iTunes U or media in the Music app. If you activated iCloud, you see the total and available iCloud storage amounts. Discloses how long you’ve used your iPhone since its last full charge. The most useful button is, perhaps, the Battery Percentage setting. When you turn this setting on, it pins an estimated-percentage-remaining figure alongside your iPhone’s pretty vague battery charge level indicator in the status bar or on the Lock Screen when the battery is being charged. Background App Refresh: When On, apps that pull information from the Internet, such as Weather or Stocks, or use Location Services, for example Reminders, will refresh even when they aren’t open so you have up to date information when you do open them or so they can send you location-based updates. You can turn the function on for specific apps, which helps conserve both battery and cellular data usage. Auto Lock, Passcode Lock (Passcode and Fingerprint on 5s), and Restrictions: You use this trio of settings for choosing the length of time your iPhone waits before automatically locking the screen, for creating a secret passcode that must be keyed in to unlock your iPhone, for setting up fingerprint recognition on an iPhone 5, and for activating and managing a slew of options for blocking functions with a password. International: Choose the written and spoken language you wish to use with your iPhone. Tap Region Format to set how dates, times, and phone numbers are displayed in apps that use that information. iTunes Wi-Fi Sync: To sync your iPhone with iTunes without using the USB connector cable, tap Wi-Fi Sync and then tap Sync Now..